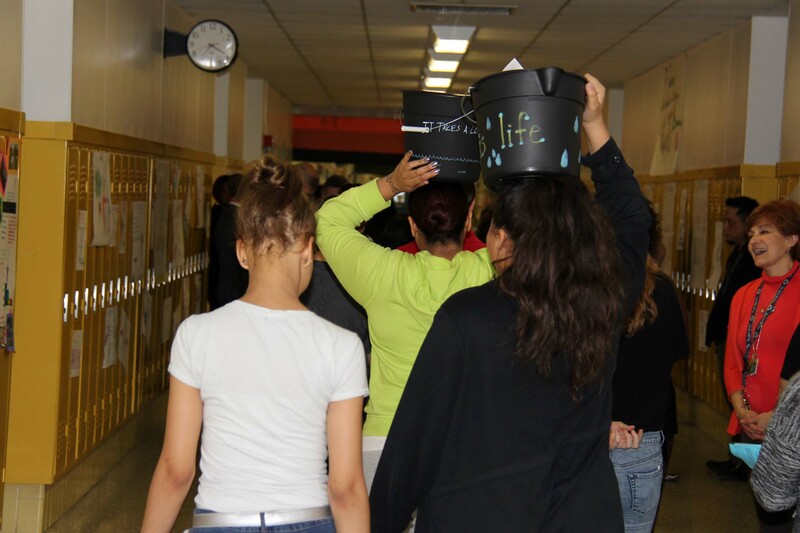 “Would you like to carry a bucket?,” asked seventh-grader Michaela Offer, holding a decorated black bucket filled with eight bottles of water. Noticing the individual’s perplexed look, Offer clarified. 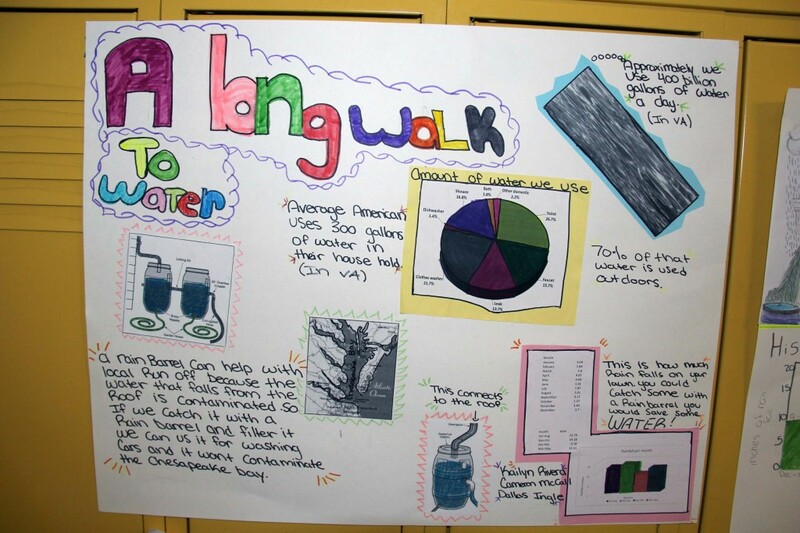 Offer and her seventh-grade peers lined the hallway to showcase their English, math, science and social studies work related to topics and themes from A Long Walk to Water by Linda Sue Park. The books tells the true story of Salva Dut, one of the Lost Boys of Sudan, and also gives a fictional view into the life of a village girl named Nya. Brandon English teacher Charlotte Baedke and her colleagues purchased enough copies of Park’s book for all seventh-graders after Baedke was awarded a Virginia Beach Education Foundation (VBEF) grant funded by The Tom Wilson Memorial Fund and Dixon Hughes Goodman. 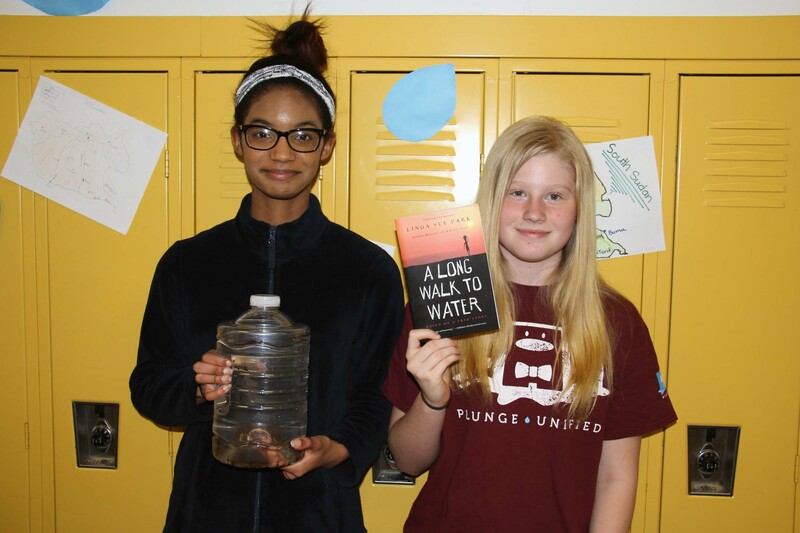 Now, with a permanent set of books in the school’s inventory, Brandon’s seventh-grade teams will be able to continue the integrated studies they call “A Shorter Walk to Water” for years to come. “We were really touched by the book when we read it, and we thought the students would really like it and the two different story lines,” said Baedke. Studying the novel in English class was only one component of the cross-curricular connections Baedke and her grade-level colleagues planned when they applied for the VBEF grant. Also awarded a VBEF grant with this goal in mind is Debbie Hubbard-Jones, one of Baedke’s seventh-grade English colleagues. Her grant project supports another novel study to “balance literacy goals with character development strategies in order to reduce incidences of bullying,” wrote Hubbard-Jones. With VBEF grant funding from GEICO, Hubbard-Jones purchased copies of Wonder by J. R. Palacio, which features a main character born with a facial deformity who tries to fit in at school. “[It] is an ideal novel for teaching kindness, compassion and empathy. There are many examples of bullying behaviors in Wonder countered by heartfelt acts of kindness,” explained Hubbard-Jones. She also purchased of a limited amount of extra copies of Wonder to permit parents to check out the novel to read along and discuss with their children. This night, however, was focused on A Long Walk to Water and students having the opportunity to share with parents and other guests lessons learned as well as to discuss their fundraising efforts for a charity that digs wells in South Sudan. One need only ask seventh-graders about A Long Walk to Water for confirmation that Brandon’s seventh-grade teachers have achieved their goals of fostering empathy, kindness and global awareness. “I learned what a refugee is and how hard it is for them to survive. I can’t imagine,” said Jayla Nicholson. “You should help each other,” said Julissa Bishop about what she learned. Student research on water and its measurement, usage and conservation is featured in the math and science projects taped to Brandon’s yellow lockers for visitors to view. Frequency tables tally rainfall amounts in inches. Volume equations calculate rain barrel capacity. “Interesting facts” detail water usage in the United States and Virginia. Cowherd and Hafley were stationed at a table to discuss their science class work with water footprints. As for Hafley’s house? “My house was a little under average, so it was better,” she said. “My parents used to live in California, and California has some water problems there, so my parents are really good at conserving water.” Hafley shared that she is trying to emulate her parents and take quicker showers at her house. 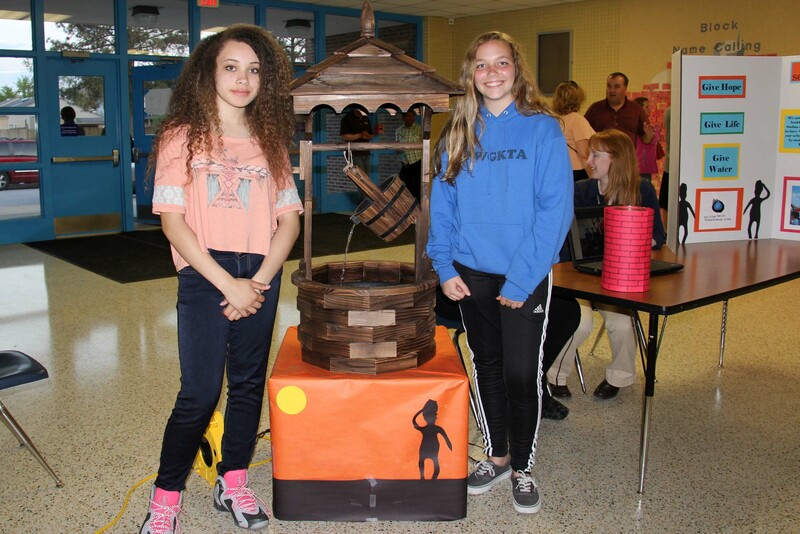 Seventh-graders Cowherd and Hafley hope their school can raise enough money to dig a well in South Sudan. Taking her book reflections one step further, Cowherd commented on student relations in her middle school, demonstrating what Baedke and her colleagues hoped would be an outcome of the studies – empathy and kindness. 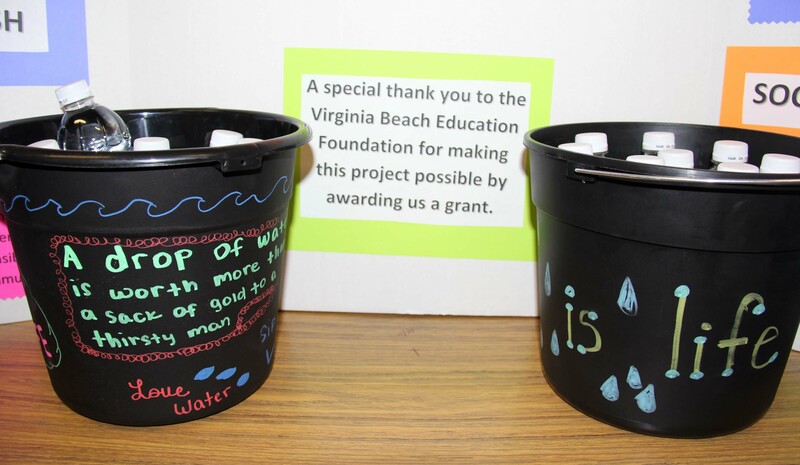 For more information about the Virginia Beach Education Foundation, including how you or your organization can support future grant projects to benefit students, visit vbef.org or contact VBEF coordinator Debbie Griffey at (757) 263-1337 or debbie.griffey@vbschools.com. What excellent projects! I’m proud to say that my child attended Brandon and absolutely thrived there, moving on to the GSWLA at Tallwood. If not for the engaging, challenging and caring faculty (and other staff too) at Brandon, she might not have been so inquisitive and willing to take on difficult projects and meet high expectations. Thanks for everything you do with your/our kids!